Located at 1,600 meters above sea level offers a temperate climate all year round and with a host of cultural and entertainment activities. This 7 hour private tour includes private transportation, lunch and hotel pickup and drop off and a private guide. You will be picked up between at 9:00 am then you will enjoy a private service beginning with a panoramic tour by the main avenues and streets of Guatemala City that includes Las Americas Avenue, Reforma Avenue, Civic Center and Olympic City. Then you will walk through historical center, visiting main square, national palace, the metropolitan cathedral, national library, central market and 6th avenue. At the end of the walk you will enjoy a Guatemalan dish for lunch in Hotel Panamerican. Before the tour finish, you will visit the outdoor mall "Cayala". You will be back in your hotel around 4:00 pm. 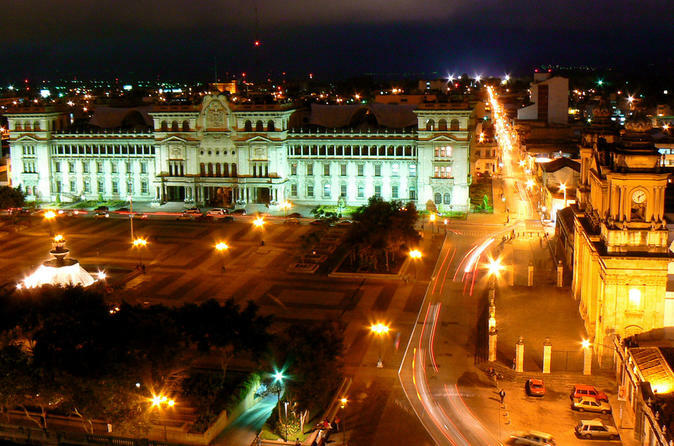 Meet Guatemala City’s downtown and its important and historical buildings. The largest city of Central America, the fourth capital after it was moved from Santiago de los Caballeros and founded in 1776 in the Valley of “La Ermita”. Located at 1,600 meters above sea level offers a temperate climate all year round and with a host of cultural and entertainment activities.